A 7-year-old entrepreneur’s lemonade dreams were crushed by the New York State Department of Health after he set up a lemonade stand without a permit, according to WLNY-TV. The shutdown has caused enough controversy that it even caught the attention of New York Gov. Andrew Cuomo (D). The state’s Department of Health recently shut down Brendan Mulvaney’s lemonade stand, which also served water, soda, and snow cones. 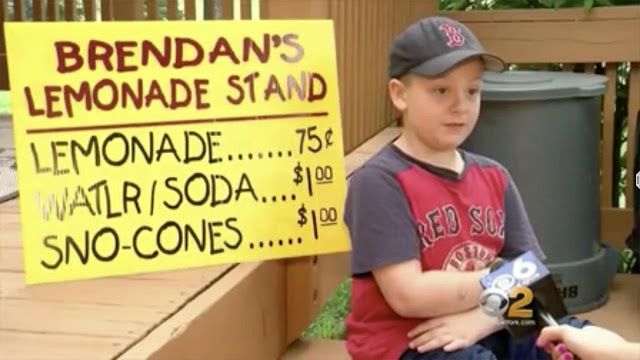 The stand was on the Mulvaney family property in Ballston Spa, New York, and according to the family, Brendan has been selling his lemonade for the last few years. Over the weekend, however, Brendan’s father Sean said that the state shut down the stand. A spokesperson for the health department, however, didn’t see it that way at all. The spokesperson told the outlet that a health inspector stopped by the boy’s lemonade stand after receiving complaints from vendors at the Saratoga County Fair — which was being held across the street from the Mulvaney homestead. The department told the Mulvaney family that if Brendan wanted to continue operating his stand, the second-grader would need to obtain the proper permit. What have people said about the shutdown? One person who spoke out against the shutdown was state Sen. Jim Tedisco (R-N.Y). According to the news outlet, Tedisco said that the shutdown “boggles the mind” and that the department’s overreach was a massive overreaction that made no sense. In response to Brendan’s stand shutdown, Tedisco is drafting legislation called the “Lemon-Aide Law,” which is intended to keep kids’ lemonade stands running and legal. Cuomo said that he’s going to look into the incident. “If it was a 7-year-old with a lemonade stand, we’re going to get him his lemonade stand back,” Cuomo said. Today I directed the Department of Health to reach a resolution with the Mulvaney family to ensure that Brendan’s Lemonade Stand can continue to operate. If a permit is needed, I will personally pay for any necessary fees. We support Brendan’s entrepreneurial spirit and wish him the best of luck. Once reopened, the Mulvaney family said that they plan to use the stand to help raise money for a family friend who is battling Blount’s disease. Young Brendan could have also perhaps reached out to Country Time Lemonade — who kicked off a promotion in June to pay off the fines of kids who were busted for not having permits, as well as pay for their permits. The program, which you can read more about here, runs through the end of August. According to the company’s promotional site, the child has to be 14 or younger and running a lemonade stand. Country Time Lemonade will cover fines or fees up to $300 per child and had allocated $60,000 for such fines and fees. So this is a real thing, then: kids getting in trouble for lemonade stands. In 2016, local government told a young California girl that she’d have to pay $3,500 in permits and building code upgrades in order to sell lemonade. The internet helped her out with that one, though, and she was able to sell without fear. In 2015, Texas officials told another little girl that she would need an operations permit, as well as one from the health department. In 2011, law enforcement in Georgia shut down another stand, saying that the children operating it didn’t have a business license or the required permits. And in 2018, over Memorial Day weekend, police shut down a Colorado kids’ lemonade stand over — you guessed it — a permit issue. Not even celebrities’ kids are exempt from such treatment. Comedian Jerry Seinfeld’s children faced a stand shutdown when they, too, were operating a stand in the Hamptons. Worse yet, the Seinfeld children’s lemonade stand’s proceeds were headed for charity.